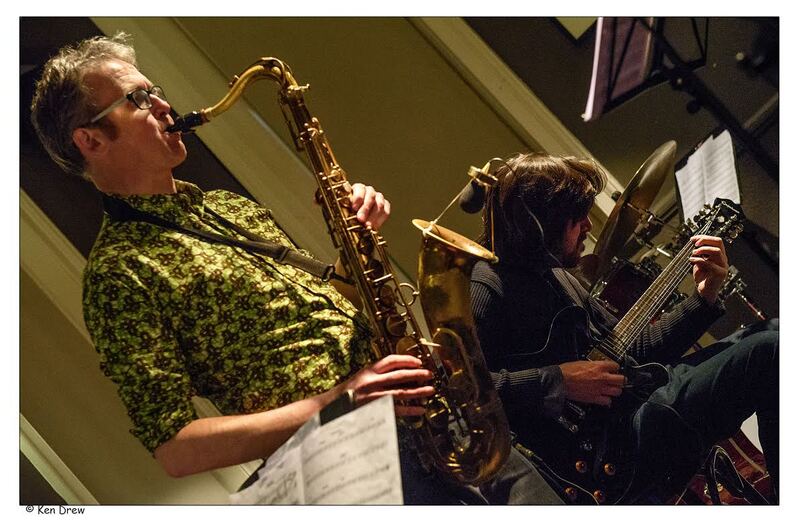 Graeme Wilson (saxophone) and Mark Williams (guitar). Grandma arrived at the Jazz Cafe last Friday and plenty of fans turned up to visit her. "What a sweet mellow saxophone sound you have, Grandma"
"All the better to enhance your listening pleasure"
"What big chords you play on your guitar, Grandma"
"All the better to attract you to my music, my dears"
And people were attracted. The Jazz Cafe was, in my experience, unusually quiet as the musicians were playing, creating a very pleasant listening atmosphere. Happily there were no wolves in headscarves around but nevertheless plenty of sharp-toothed playing. The two fine musicians that make up Grandma are both excellent individual players but together make up a whole that is more than the sum of their musical parts. The duo plays tunes written by each of them and have developed an excellent understanding of each other's approach. Each leaves the other plenty of space but then add harmonic touches and pick up on riffs on the other's solos. At one point in the middle of a tune one of my bar-leaning companions said (in a low voice) the piece could do with a little lift and, right on cue, the tune immediately took off and was sensational. That's jazz for you! Sometimes it was a little hard to hear the titles of the various pieces as there was no microphone and Grandma Wilson was inclined to mumble slightly into his multi-coloured shirt but I'm not sure that made any difference. One intro I did hear was when Wilson said the next piece was by Williams and was called Bye the Bye. "What's that about?" asked Wilson, "Oh, just bye the bye" said Williams gnomically. Anyway it didn't matter as it could have been called 'Little Red Riding Hood Meets the Big Bad Wolf' and still would have been an excellent tune. This is a great duo of top musicality and well worth looking out for. PS - I am happy to report that no young children were eaten during this gig.